(LANHAM, Md. )— U.S. Environmental Protection Agency (EPA) Chief Information Officer Malcolm Jackson will be the keynote speaker at the Historically Black Colleges and Universities (HBCU) Entrepreneurship Conference hosted by Alabama State University on March 5 in Montgomery, Ala. The conference is titled Entrepreneurship: Transforming Education, Government and Industry. The goals of the conference are to enable attendees the opportunity to learn about business development, entrepreneurship, grants, contracting and fellowships, with a special focus on science, technology, engineering, and mathematics from an entrepreneur's perspective. The conference is held on March 5-7, 2012. The leadership team at ASU said they are thrilled to have EPA CIO Jackson visit their campus and are eager to hear him share insight on how entrepreneurs and the higher education community can help the EPA to protect human health and the environment. 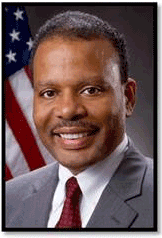 Jackson is EPA’s Assistant Administrator for the Office of Environmental Information and Chief Information Officer. In this dual role, Mr. Jackson is responsible for IT operations and security, information quality and collection, and access to environmental information including the Toxics Release Inventory. His leadership focus includes IT strategic planning and governance, IT investment management and government transparency. CIO Jackson was appointed to serve this role by President Barack Obama. Mr. Jackson holds a BS from Jackson State University, an HBCU in Mississippi, and an MBA from Northwestern University, J.L. Kellogg School of Management. The Office of Environmental Information (OEI), led by CIO Jackson, manages the life cycle of information to support EPA's mission of protecting human health and the environment. OEI staffers identify and implement innovative information technology and information management solutions that strengthen EPA's ability to achieve its goals. They ensure the quality of EPA's information, and the efficiency and reliability of EPA's technology, data collection and exchange efforts, and access services. They also provide technology services and manage EPA’s IT investments. HBCU Conference officials state that the event will provide information to its attendees that can improve corporate and higher education partnerships, significantly affect the growth of HBCU’s and enhance regional economic development opportunities. They anticipate attendees from federal, state and local agencies, corporations, small businesses, nonprofit organizations, colleges and the public. For additional information about the conference, visit www.asu-hbcu.org.